How Do You Define Fresh? This week’s Photo Challenge prompter offered a way to define fresh. For her, she understands that something is fresh based on its colour, textures and the presence of another object that is able to assert the notion. Is that enough to get by? My confusion about the definition of fresh made me chose the following photo to answer this week’s Photo Challenge. So, according to Oxford Dictionary, fresh (Of food) is recently made or obtained; not tinned, frozen, or otherwise preserved. If I were to follow what people in Oxford told me, there is basically nothing fresh about this photo. 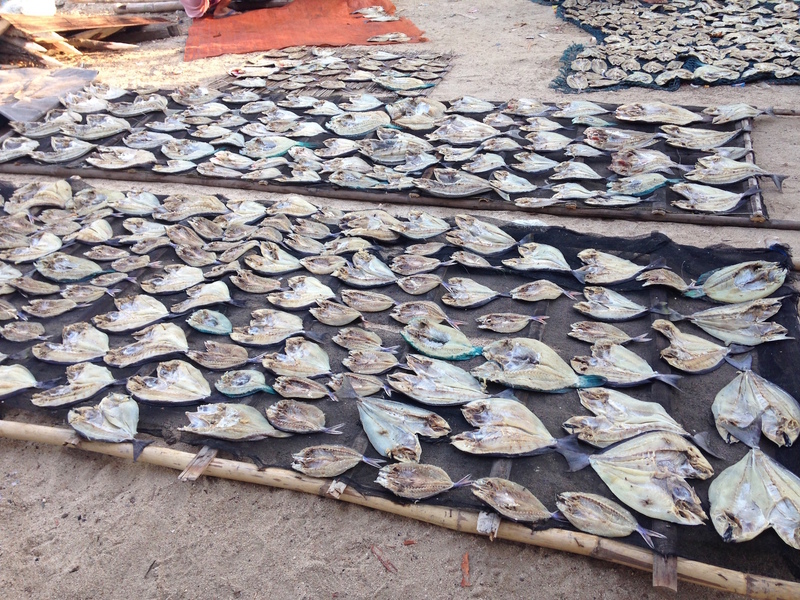 It’s a photo of salted fish(es), which is basically a way to preserve fish. The salted fish(es) in the picture basically represent my understanding (or lack thereof) about the concept of fresh. Those fishes were freshly caught from the ocean, hours before the photo was taken. They were then freshly cleaned and seasoned with freshly made salt. Then they were put outside, left to dry with help from the fresh wind and fresh rays of sunshine. Sometimes this process was repeated as another fresh day commenced. How come, at the end of the process, I was left with salted fish that, using the Oxford Dictionary judgment, was not fresh? Confusing. Then, what happens if you take the salted fish home, cook it, maybe fry it, with a little bit of freshly made sambal? When you put the dish on the table, still hot from the pan, does it become a freshly made dish? Even though the main ingredient is not (supposed to be) fresh? How exactly do you define fresh? I’d say your salted fish was fresher than fresh! I wouldn’t define dried or otherwise preserved fish as fresh… Nevertheless it can be delicious to eat 😉 But the fish at the picture seems to be still fresh at the moment when the picture was taken. Fresh fish for this week’s challenge. I think this is a really great idea! I had a big smile on my face when I saw it. Everybody who knows the comics of Asterix will know why. Thanks for stopping by and leaving a reminder to Asterix. I know what you mean about fresh fish. hahaha.